There were three separate Girls’ boats at Stoke Bruerne last night. Of the first (Girls A, the pink-sashed 40 year old, the hapless dunker and friends) there was no sign this morning, all still asleep in their boat presumably. Girls B, the raucous sailor-hatted crew, were quiet, soggily sitting on chairs or on the boat in their pyjamas at about 9am. Rather like a campsite… Girls B are also marking someone’s 40th birthday. Girls C, on the other hand, were younger, school and university friends, some from Devizes in Wiltshire, so several of their crew had actually seen locks before – which was absolutely not the case for Girls B! As Cleddau cruised this morning towards the Top Lock Girls B begged for company down the locks as they didn’t know what to do. But at the Top Lock was waiting a solo boater and valiantly he took them on, supported by Boatwif and others. Just getting crew off their boat (minus breakfasts) to see what needed to be done was – interesting! Solo Boater found an instructor’s voice, and by the second lock had the girls lined up gazing at the gates and paddles. The locks (7 altogether) were busy and the flight attracts walkers and spectators at various points. Girls C had moored below the second lock and, mid-morning, they joined Cleddau for the remaining locks. How pretty their boat looked, customised with cotton bunting and a beer bottle filled with wild flowers on the front deck. The girls were keen to learn and delightful company. One is on a three year biology fellowship at the University of Trinidad; their steerer is a Foreign Office wife, first foreign posting in Pakistan, but now in Latvia. Two hours later than might have been expected Cleddau reached Bottom Lock. Gradually the boats spread out. Mentor to Girls B had moored up. “Well, did they shape up alright?” asked the Captain. “Yes, they shouldn’t kill anyone now,” was the gruff reply. The boat meandered on, not quickly, as we caught up with Girls B, who had learned to steer slowly past moored boats and through bridge holes. Then, at the second bridge, there appeared a small group of women, three or four of them, all laden with Tesco shopping bags. “Oh, well ours should all be wearing stripy T-shirts!” Maybe that was the Girls A boat, still asleep as we left! Apart from a brief reassuring word with Girls B an hour later as they pulled in at a pub that was the end of contact with the girls various. The rest of the day, like the butterflies and dragonflies, drifted by, with just one more lock (at Cosgrove) and some curious sightings: a tandem; a surfboard catamaran; Cosgrove’s ornamental bridge; the littlest boat ever being pulled out of a lock (its owner, on seeing the camera, pleading “Just don’t put me on Facebook!”); a mangle on top of a boat; the Iron Trunk Cosgrove Aqueduct (winner, last week of the regional people’s vote for heritage lottery money); the stunning Wolverton transport mural and also the new canal side apartments at Wolverton. Most special (but not caught on camera) was the arrival of a bridal party to cruise on a trip boat to a wedding reception. Tonight, just before dusk, a walker, in cords, jacket and floppy hat, lolloped along the towpath. By his own definition he is a “canal anorak”, having walked now some 2,000 miles of canal towpath. He derived great joy in figuring out the 295 mile route from the Macc that Cleddau must have taken! 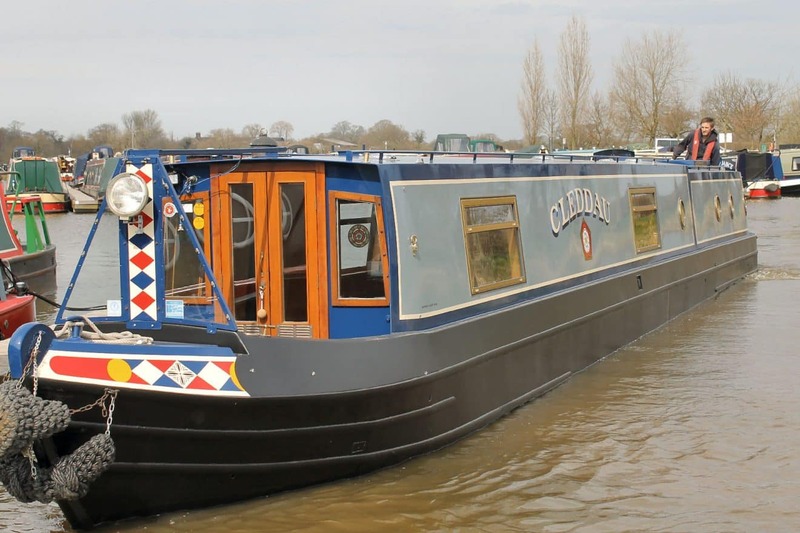 On this still evening, with only late birdsong to be heard, Cleddau is within 6 miles of the Milton Keynes marina where she will lodge for the next couple of months. Maybe tomorrow there is time for just one more tiny adventure or curious encounter…?